My 4th great-grandfather Johann GROELINGER (1766-1840), son of Peter MERTSCHERT (c1737- 1768) and Susanna SCHNEIDER (1737-1778), was born in Holsthum on 8 May 1766. He was their fifth and last child. The family lived on the Schneider-Vogtei which had come into their “possession” through Johann’s mother Susanna’s family. 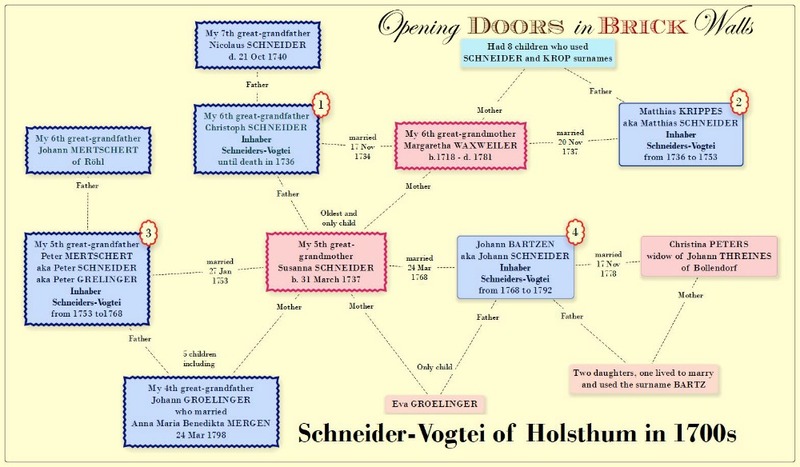 The historical background of the SCHNEIDER family and the Schneider-Vogtei were dealt with in the Prequel to The Groelinger-Mergen Family of Holsthum, Germany in order to make it easier for my readers to understand the confusion of the surnames used by Johann GROELINGER and his parents. To simplify it a bit more I created this mind map with Scapple. Johann married Anna Maria Benedikta MERGEN (1769-1829) on 24 March 1798 in Schankweiler. At the time Holsthum was part of the Schankweiler parish. In the marriage record, the father of the groom’s surname was given as GROELINGEN alias MERTSCHERT. His father had passed away in 1768 when Johann was 21 months old. His mother Susanna SCHNEIDER remarried within a month and her husband Johann BARTZEN became the holder of the Schneider-Vogtei. 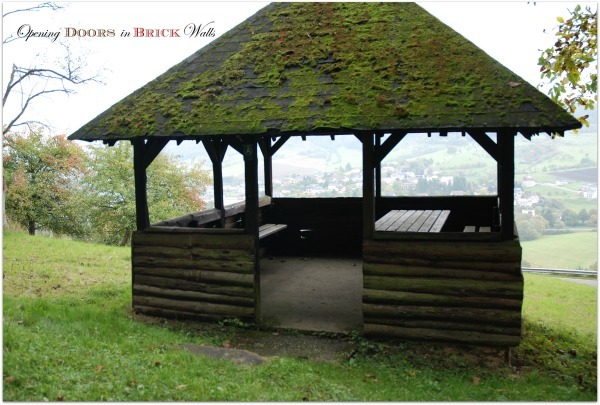 On the road from Ferschweiler to Holsthum, there is a resting/picnic hut for hikers. Gertrud THELEN and Theodor MERGEN had married on 21 December 1767 in Holsthum. Theodor was a Rinderhirt or cowherd in Holsthum as was his father-in-law. Neither of Anna Maria Benedikta’s parents was found in the 1766 census. Anna Maria Benedikta had at least three sisters: Anna Maria born in 1771, Anna Maria born in 1781, and Maria Katharina born in 1786. The repeated use of the name Anna Maria may mean one of them did not survive but as seen in other families there is the possibility of names being used for multiple living children. The Familienbuch Schankweiler does not give any further information on these girls. Church records, according to the compiler of the book, are missing for large periods of time. Perhaps when I visit the archives in Bitburg I may be able to pick up the trail of these siblings. For example, if they were godmothers of one or the other child born to Johann and Anna Maria Benedikta. Also, if they married, a husband may have been the informant on the deaths of the parents-in-law. Johann and Anna Maria Benedikta named their first two sons after their fathers. Their first son was born on 10 January 1799 and named after Johann’s father Peter and their second son was born on 17 November 1800 and named after the maternal grandfather Theodor. Johann’s brother who shared the same name died on 11 November 1801 at the age of 39 years. He likely never married. A view of the town of Holsthum from the resting/picnic hut. The Napoleonic Wars had been underway five months when Johann and Anna Maria’s first daughter was born on 14 October 1803. Their next daughter Maria Catherina was born on 28 February 1805 followed by Susanna, named after the paternal grandmother, on 1 August 1807. I find it unusual that neither of the first two daughters nor the three born after Susanna was named Gertrud after the maternal grandmother. Magdalena was born on 20 August 1809, Elisabeth on 17 April 1812, and Maria Katharina on 2 June 1814. The Napoleonic Wars came to an end in 1815. Johann and Anna Maria Benedikta were still having children. Their son Wilhelm was born on 3 February 1817. His birth was followed three weeks later by the death of his maternal grandfather Theodor MERGEN on 24 February 1817. The widow Gertrud THELEN died a little over a year later on 2 April 1818. It is the death records of these two individuals which I hope may include the names of one or the other son-in-law who is at this time unknown. Two more sons were born to Johann and Anna Maria Benedikta. Johann on 18 August 1818 and Gerhard on 2 May 1821. All of the children were born in Holsthum where Johann and Anna Maria Benedikta lived. The first of these children to marry was the third child Maria. She married Ludwig GERMAN on 23 August 1827 in Schankweiler. Their first child, a son named Johann, was born a month later. 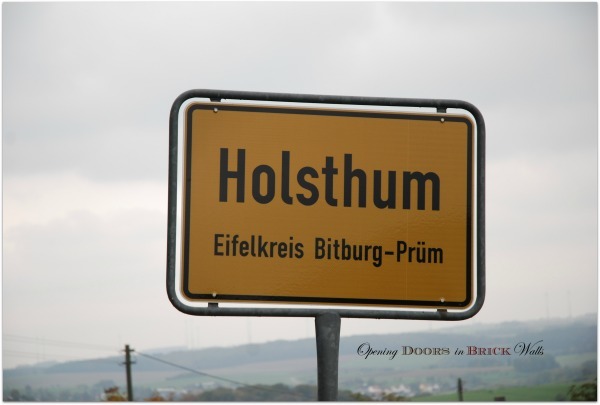 The family moved from Holsthum to Ließem were at least two other children were born. Anna Maria Benedikta MERGEN died on 6 February 1829 at the age of 60. Preparations for the marriage of her oldest son Peter may have been underway when she died. Peter married Margaretha PROST on 1 March 1829 in Biersdorf. The second son Theodor married Margarethe WALLENBORN on 5 June 1831, also in Biersdorf. And the next marriage also took place in the same town when Maria Catherina married Johann Adam ERSFELD on 11 January 1832. One last marriage took place before Johann GROELINGER passed away. Magdalena married Johann PHILIPP on 19 January 1839 in Schankweiler. Johann GROELINGER died on 11 December 1840 in Biersdorf. As this record of death has not been viewed I can only assume he was visiting one of his children who had married in Biersdorf or he was living with one of them. Johann lived to the age of 74 years. The first of his and Anna Maria Benedikta’s eleven children to die was Maria who had been the first to marry. She was living with her husband in Menningen at the time. She died on 30 March 1841. He remarried within two months. My 3rd great-grandmother Maria Katharina married Theodore PÖPPELREITER (1816-1891) on 20 January 1842 in Mettendorf. Slowly but surely Johann and Anna Maria Benedikta’s children were setting up their own households. Gerhard married Helena Rosa LUDES on 25 October 1850 on Bickendorf. Ten of the eleven children were married by 1850. Only son Wilhelm’s marital status is unknown at this time. A family with nearly a dozen children and all (except for Wilhelm whose fate is unknown) married and had children. No infant deaths. This may have something to do with the family coming from the Schneiders-Vogtei and possibly being more prosperous than families who came from manual and domestic laborers. While up to nine different family books were used to trace the children, the family of the youngest son Gerhard was only traced through Thomas Pick’s Homepage for Eifel Birth and Marriage Data. The extracted information shows he married and had eight children in Bickendorf but does not include the names of the parents of Gerhard. 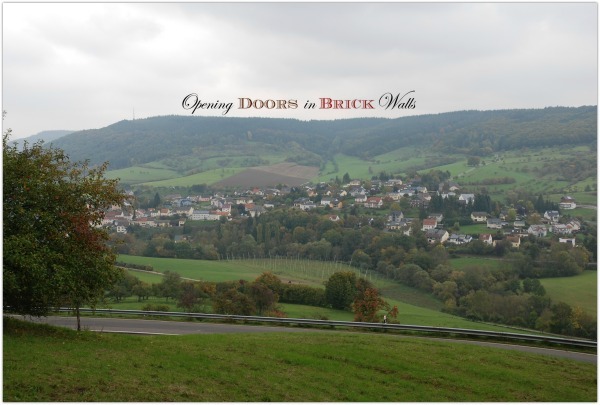 The family book for the town of Bickendorf may be in our Luxracines archives in Walferdange. I was working my way back through the ancestors and had not gotten around to searching for descendants or checking for the Bickendorf book. 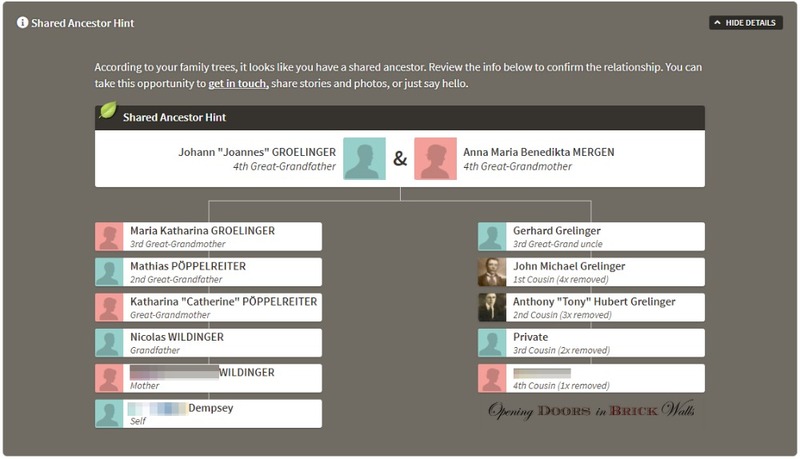 Pick’s database shows the surname spelled GRELINGER which had me wondering if this Gerhard was the son of Johan GROELINGER and Anna Maria Benedikta MERGEN. I didn’t want to be following the wrong family. After finding a descendant who is a DNA match to my brother on AncestryDNA with one of those shaky leaves which indicate a Shared Ancestor Hint, I am convinced the spelling of the GROELINGER name changed to GRELINGER for youngest son Gerhard when he married and moved to Bickendorf. Gerhard’s son, a farmer, Johann GREHLINGER, born on 20 March 1858, single, requested permission to go to North America on 29 August 1881. He said his parents owned residential and economy buildings, and he had the necessary means to travel. Records indicate this son who went to America in 1881 was Johann Michael GRELINGER. He bought a farm five miles outside of Beloit, Mitchell County, Kansas, in 1893 and married in 1894. The match my brother has is a descendant of this line and shares 25 cMs across 2 segments. He had three siblings who also went to America. His oldest brother John arrived in 1871 and his second oldest brother Michael in 1876 per the 1900 and 1910 census when they were living together with their youngest sister Elizabeth who came in 1893. John and Michael both owned farms in Jewell County, Kansas, likely adjoining. The siblings, seen as GRELIER on the 1900 and 1910 census, were and would remain single. The GRELINGER cousin was found with a Shared Ancestor Hint. Since there were no other hints I searched for matches with the surname GROELINGER and GRELINGER in their trees. I found GROELINGER in this tree. The surname GERMANN was a red flag as this was the surname seen in the first marriage to take place for one of the children of Johann and Anna Maria Benedikta. Their daughter Maria married Ludwig GERMAN in 1827. The owner of this tree has not made the connection to the parents. The match is a fifth cousin and shares 11.4 cMs across one segment. Since the second match is considered a distant match, Ancestry does not show it as a shared match with the first test which is classified as a fourth cousin match. To compare the chromosome segments I need both of these matches to upload their raw DNA to Gedmatch. I sent messages this morning but they only went through after several attempts. I would like to finally be able to add a maternal segment to the DNA map I am working on – it would be the first. Lika Hellwig, Ortsfamilienbuch 1 Biersdorf mit Hamm, Wiersdorf, Oberweiler, Nierderweiler, Beifels sowie zeitweise Echtershausen und Ließem 1714 bis 1899 (July 2002). Bodo Bölkow and Richard Schaffner, Familienbuch 2 der Pfarrei St. Lambertus Edingen an der Sauer Daten bis 1798 aus den Kirchenbüchern der Pfarrei Echternach (damals für Minden und Menningen zuständig) mit Edingerberg, Minden u. Menningen 1680-1899 Edingen selbst ab 1705 (2000). Richard Schaffner, Familienbuch 2 der Pfarrei St. Marcus Ernzen bei Irrel, Daten bis 1798 aus den Kirchenbüchern der Pfarrei Echternach (damals fur Ernzen zuständig); mit: Ernzen-Hof, Fölkenbach und teilweise auch Prümzurlay (Häuser der rechten Flußseite) 1680-1899 (2000). Richard Schaffner, Familienbuch der Pfarrei St. Hubertus Körperich in der Südeifel mit Körperich, Niedersgegen, Obersgegen, Gentingen, Roth an der Our, Seimerich und Scheuerhof (später Neuscheuerhof) 1689-1899 (2002). Werner Naumann, compiler, Familienbuch der Pfarrei Mettendorf Dekanat Neuerburg, Band 1 A-M Band 2 N-Z (1992). Richard Schaffner, Familienbuch der Pfarrei St. Petrus Nusbaum in der Südeifel mit Nusbaum, Nusbaumerhöhe, Freilingen, Freilingerhöhe, Enzen, Silberberg, Stockigt, und Rohrbach 1722-1899, PDF (Kordel bei Trier, 2001). Werner Neumann, Familienbuch der ehemaligen Pfarrei Schankweiler mit dem Pfarrort Schankweiler und den Filialen Holsthum und Peffingen (Trier, 1990). Werner Lichter, Familienbuch Utscheid (Outscheid) St. Peter 1728-1899 mit den Ortsteilen Buscht und Rußdorf (2009). Irmgard Schmitz, Familienchronik der Pfarrei Wissmannsdorf mit ihren Filialen Brecht, Hermesdorf und Koosbüsch (2009). Josef Mergen (1954) and Heinz Weber (1995), Die Amerika-Auswanderung aus dem Kreis Bitburg im 19. Jahrhundert (2009). Great mind map—it really did help. And I love your photographs. It looks like such a beautiful country. Good luck with the DNA—it seems you have really made some good finds. I heard back from the 4C1R. Yeah! Thank you, Amy. I’ll let my photographer know you loved the photographs. I was delighted to find this post, as I am a descendant of Maria Groelinger and Ludwig German, through their son born in September 1827! In fact, I spent some time yesterday with various civil and church records from Schankweiler, as well as the Familienbuch for that place. Could you please tell me where you obtained a copy of the Familienbuch for Edingen parish? Maria and Ludwig emigrated to Illinois from Menningen in that parish in 1855. That couple bounced around the Rhineland quite a bit beforehand (Ludwig was a shepherd), which has made finding records for all of their children interesting, to say the least! My apologies, Marsha, for not getting back to you on this comment. I took a break from blogging and missed the notification. Thanks for getting in touch via Luxracines.